Description: Kempas is generally imported from Asia and grows in Malaysia and Indonesia. The heartwood is a fairly consistent color which ranges from orange-red to reddish-brown with subtly contrasting yellow to pale white tones. The heartwood will darken with time. Kempas is somewhat similar to Cumaru from Brazil but does not have as much definition in the grain. 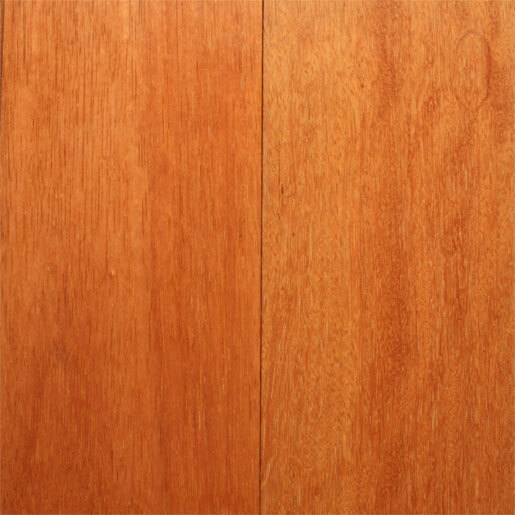 More Info: Kempas has been very popular as a less expensive alternative tropical hardwood. Available in prefinished solid only in two widths. Color: Orange-red to red-brown heartwood. Tree Characteristics: The Kempas tree can reach heights of 180 feet and diameters of up to 6 feet. Geographic Area: Malaysia, Indonesia, Philippines, Papua New Guinea. Found in lowland forest in swampy areas. Drying Characteristics: Rated as medium difficult to dry. Working Characteristics: Difficult to work, like most tropical hardwoods.